How do you take content formatted to the print medium and bring it to the interactive space? It’s been a burning question for the comics industry, whose many attempts to reinvent comics in the digital space have failed in the past. 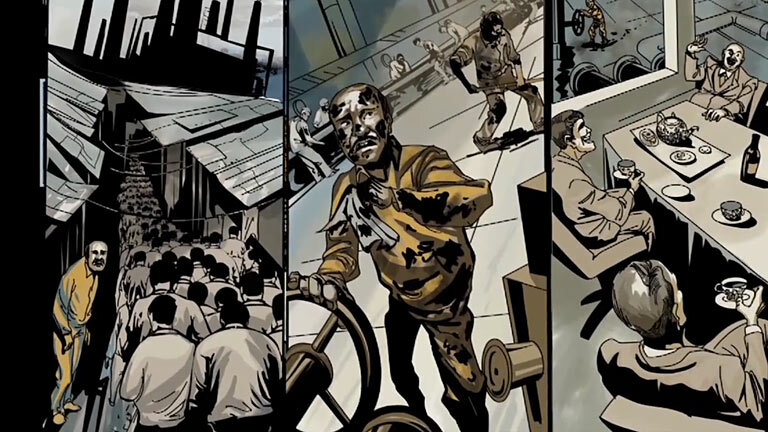 Enter Cognito Comics founder and creative director Daniel Burwen with his award-winning interactive graphic novel app CIA: Operation Ajax, based on Stephen Kinzer´s book that reveals the true story of how the CIA overthrew the Iranian government in 1953. Daniel is genuinely passionate to pioneer digital storytelling formats. Coming from the gaming and interactive media industry, it’s no surprise his latest project embodies a successful experiment that elevates motion comics to the place they need to be. We met up with Daniel ahead of his keynote at the Webdox 2013 conference in Leuven. Watch our video interview to get his take on the future of motion comics, the sweet spot for telling stories in interactive ways, and how the iPad changed the game forever. Daniel mention our interactive motion comic The Killer (2001) as a source of inspiration. See also: our 2011 interactive motion comic, The Art of Pho. Recorded during the Webdox2013 conference at STUK in Leuven, Belgium. Thanks to MEDIA Desk België – Vlaamse Gemeenschap, iDrops and Docville.